Obituary for Silas Mack, Jr. | Wright Funeral & Cremation Services, Inc.
Silas Mack, Jr., (James Johnson), 91, of Philadelphia, PA, passed away September 25, 2018 at the Meadowview Rehab and Nursing Center in Philadelphia. He was born to the late Silas Mack, Sr., and Annie T. Mack, on June 27, 1927, in Merigold, Mississippi. Silas was a welder by trade. He belonged to Local 135 Laborers International Union of North America, and was the owner of J.J. Cutty's Lounge, 1501 W. Columbia Ave., Philadelphia. James Johnson (Silas Mack) was a longtime member of Green Hill Baptist Church in Philadelphia, where he was under the leadership of Rev. Robert Green. 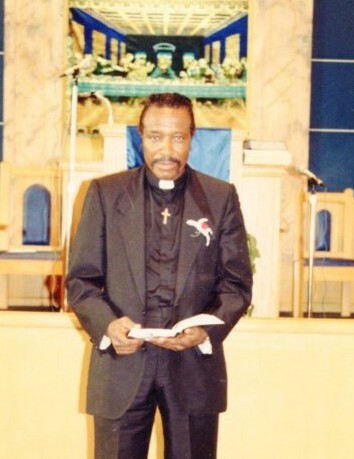 James (Silas Mack) was ordained as a deacon on February 2, 1986. On June 14, 1987, he received his Certificate Of Licensing, thus answering his call to the Gospel Ministry. In August of 1988, on the 25th day, James Johnson (Silas) accepted his Certificate of Ordination. Rev. Johnson (Silas Mack) then began his journey to preach the Gospel as he had opportunity, and to exercise his gifts in the work of the ministry. He loved the Lord Jesus Christ and it was his love for his family that he desired to get as many souls saved as possible. Silas (James) was preceded in death by three sons, Carl E. Mack, Athen Allen and David Mack; one daughter, Constance Marie Mack; four sisters, Mary Wade, Matilda Crutchfield, Henrietta Allen and Florence Lloyd. He is survived by one son, Silas Mack, Jr. (wife Antoinette Mack) of West Chester; two daughters, Margaret Mack Lawrence (husband Carl B. Lawrence, Jr.) and Shirley M. Simpson (husband James Simpson), both of Coatesville, PA; sister, Estella Mack London (husband Moses London) of Coatesville, PA, and a host of grandchildren, nieces, nephews, friends and family who loved him. A Memorial Service will be held 10:30 AM on Saturday, November 24, 2018 at Judah Ministries COGIC, 840 East Chestnut Street, Coatesville, PA, with a visitation beginning at 10 AM. Graveside interment service will be in New Evergreen Cemetery, Coatesville, immediately following the Memorial Service.